Depending on whom you ask, a resume may be viewed as the single most important vehicle to securing your next job, or it may be viewed as an unnecessary nuisance. 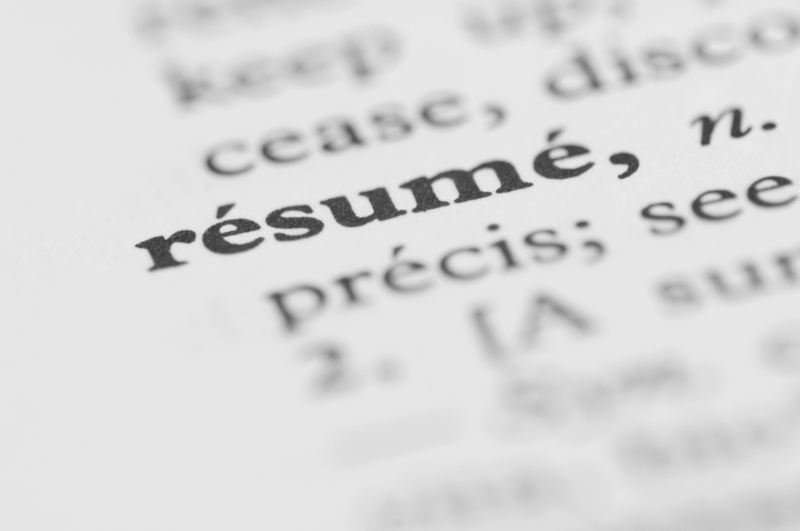 In actuality, a resume is a professional introduction meant to encourage a one-on-one interview situation; an opportunity for communication that can lead to a job offer. It is a rare candidate who is hired by his or her resume alone. It is just as rare to be offered an interview without one. A resume is often the first line of contact. It establishes a first impression of a potential job candidate’s skills, background and hiring value. If written well, this impression can be a positive one, offering the reader a sense of the candidate’s “fit” for the position and company being targeted. If written really well, it may convince the reader that the job candidate is the person most ideally suited for the job. When coupled with an effective cover letter, the resume can be a very strong marketing tool. Preparing a resume may be seen as a nuisance, but having a well-constructed, well-designed resume is an important part of your job search. Consider that for each available job opening there may be as many as 100 to 1000 resumes submitted. If your resume fails to adequately represent your qualifications (for the specific position), fails to establish your hiring value over competing candidates, or is difficult to follow, your ability to compete against those other 100 to 1000 professionals vying for the same position will be greatly diminished. If your resume secures an interview, then it has done its job. If it sets you ahead of the competition in the mind of your interviewer, then it has given you a distinct advantage and gone beyond its main objective. Good job! Because that should be your goal. A great resume does what all good marketing pieces do: it sells the “consumer” (the potential employer or hiring manager) on the “product” (you). Like it or not, the act of looking for employment is a function of sales and marketing. The product you are “selling” is you, and the “customer” (the person you hope will “buy” the product) has unique needs and interests. This customer (potential employer) needs to be sold on the fact that you have what it takes to get the job done, that you will meet or exceed the needs and expectations of the position, and you will be worth the compensation. The reader of your resume is going to want to know how you are going to solve his or her problems, and they are going to give your resume a whopping 15 seconds, or less, to sell you. 15 seconds is the average time a hiring manager will spend “reading” a new resume – before giving it a potential “yes” or “no” response. Will your current resume succeed under these conditions? In preparing your resume, the more you know about the position you are targeting, the better. If you know the company’s missions and goals, if you understand the needs and expectations of the position, if you recognize the target company’s “concerns,” if you understand who comprises the company’s customer base or target market… AND you (and your unique skills and experience) can meet these needs and expectations (you have accurately assessed your own value and are able to communicate how your skills, experience and contributions have benefited employers in the past), then you will have the material necessary to create an effective marketing piece. As in any type of marketing collateral, it is important to present the information so that it captures your reader’s interest quickly. Your goal is to encourage the reader to stay with your document as long as possible. Your chance for a more detailed reading increases when you give the reader information which he or she most wants to secure, early in the document. One of the best ways to accomplish this is to create a Summary Section at the beginning of your resume. A Summary Section highlights for your reader those personal and professional skills you possess that are relevant and valuable to the position you are targeting and allow you to excel in your chosen field and position. Items and skills of greatest importance (from your readers’ viewpoint) should be listed in priority, supporting an impression of both “fit” and potential success. In addition, these should be aspects of your background that set you apart from your competing candidates, particularly candidates with skill sets similar to your own. You are, in effect, showing your reader how you will solve their problems – better than the competition – and why interviewing you will be a worthwhile expenditure of their time. First, let us be very clear about one important fact: you are not writing a career autobiography. This is not about you. Seriously. It is about how you can meet the needs, interests and expectations of your reader and this particular position, at this particular company. It is all about them: about what they need, what their hopes and expectations are, and how what you bring to the table will meet these expectations. It is all about how you will benefit them. The interview stage will be your first opportunity to negotiate; when you will get a chance to discuss what you hope to get out of the deal. But right now, the only person who matters is your reader. They hold all the marbles. When writing your resume, keep in mind what your reader needs to know. Listing information that will be of no value or benefit to the position you are targeting or the company in question, is just a waste of time. And not only does the information have to have value (from your reader’s point-of-view), but it should be interesting, so that your reader wants to keep reading. If the information or dialogue feels repetitive or lacks flow; you will quickly lose your reader’s attention. Check for redundancy in your statements. If the positions you have held are similar, then repeating the same functions, over and over, in ad nauseam detail, will lose your reader’s interest (heard it, got it). However, never short-change your accomplishments. Your potential employer is most interested in seeing how hiring you will benefit the company. But keep this in mind, as well: if it were your job to fill this position, how important would it be to you to hire the best person possible, knowing this decision will reflect back upon your own capabilities? If you are dealing with a hiring manager or human resource director, you can bet this person has a lot riding on the fact that, if you are hired, you are the right person for the job. It is extremely expensive to recruit, interview, hire and train, only to let an employee go and start the whole process over again. It is the HR director’s job to make sure the right person is hired the first time. All parties involved want to know the right hiring decision is being made. Make it your job to assure them that hiring you is a very good idea. The most effective way to achieve this is by identifying how your efforts and contributions have benefited employers in the past. Take credit for your participation and accomplishments. Know the quantitative results of your efforts (numbers, figures, dollar amounts, and percentages) wherever possible. While aspects of your background may seem minor or of little value to you, they may be seen as a valuable asset to those looking to fill a need. The layout of your resume is extremely important. Your resume needs to maintain a “clean” and professional appearance (remember, it is representing you!). It should allow the reader to access the information quickly, even at a glance. Neat margins, adequate “white space” between groupings, and indenting to highlight text all aid ease of reference and retention of the material. Use bolding and italics sparingly. Overuse of these features can actually diminish their effectiveness of promoting the material they are intended highlight, and can also reduce overall readability. Your contact information (how the reader can reach you) is essentially the most important information in the entire document. Make certain your name, address, phone number, and e-mail address are clearly visible and at the top of your document (from habit, this is where your reader will look for this information – do not make them search for it). If your resume is more than one page in length, be certain that your name is on these secondary pages, in case the sheets become separated. The standards for resume length have changed. It used to be typical for resumes to be no more than one-page in length. For candidates with years of experience, having held multiple positions, or having worked with multiple companies, or who have outstanding achievements to present, this one-page restriction can result in a document that is unreadable, looks “squashed,” or utilizes a font size so small that the reader is forced to squint (no, they won’t bother). The one-page standard no longer holds true. Use as much space as you need to concisely, accurately, and effectively communicate your skills, history, achievements, and accomplishments – as these relate to the position and company being targeted. A two-page document, if presented well, will not diminish the effectiveness of your marketing strategy, as long as the information you provide is relevant and valuable to your reader’s needs, goals and interests. A three-page resume is requiring much of your reader’s time (and patience), and may not be as effective as a more concise presentation. In fact, your reader may wonder if you have difficulty conveying your value and are unable to create a concise and powerful presentation. In academic fields and European markets, it may be necessary to go over two pages in length, because additional detail and information is required. But only provide this much information if you feel it will be beneficial and if you are certain your reader will agree with you. An overly long presentation may leave the reader wondering if you believe their time is not valuable. Remember, by creating something in writing (just like this article), you are demanding the reader’s time and attention. This is fine – just do not waste their time. Document, in detail, the most recent 10 to15 years of your employment and/or experience. Longer if the most recent position extends back 10 years or more. Be certain to highlight growth and advancement in any company where multiple positions were held, including identification of promotions and increases in responsibility. List prior positions in decreasing detail, unless a previous position more effectively represents your skills and experience relevant to the position and company you are currently targeting. You want to entice you reader into wanting to meet you (the interview) to learn more. Current history and recently utilized skills will hold the most value. Remember, you will have an opportunity to expand on the information provided in your resume during the interview. So, in your résumé: establish your qualifications, indicate the benefits of hiring you, and entice your reader to want to learn more, through a one-on-one interview. You can never be certain what your recipient may do with your resume once he or she is in receipt. Therefore, you want to make sure your resume can hold up to various processes such as faxing, scanning or photocopying. Because of this, it is also a good idea to bring along fresh copies of your resume to each interview. Many interview sessions are held by multiple interviewers, and each interviewer should have a clean copy of your resume presentation (not a photocopied version). Having a clean copy of your resume with you can also help if you if you are required to complete a job application or formal company documents. A resume will not, typically, get you a job (well, it has happened, but it is extremely rare), but it can secure your chances of being seen and interviewed for a position or company that interests you – just as it can cause you to be passed over in favor of a candidate who offers a better presentation of what he or she has to offer. It is often your first opportunity to make a company aware of you and all you have to offer. As with any type of marketing campaign, use your resume as one tool in your job search. Continue to network, improve your interviewing skills, and use every avenue available to you to better your chances and opportunities. And, when you have secured that next position, do this all over again. Always be prepared for the next opportunity. Keep your resume up-to-date and stay career fit.